The nearly nine-hour round trip from Three Lakes to Whitewater didn’t seem all too appealing to Bluejays head track and field coach Andy Wyss last week. 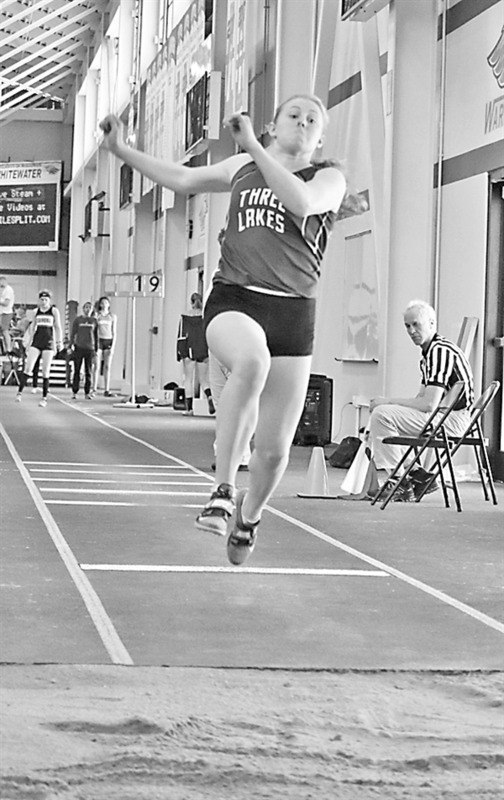 After a long spring which included indoor meets in Eagle River, Stevens Point and Ashland, Wyss contemplated even participating in last Saturday’s Wisconsin Track & Field Association Indoor Championships at UW-Whitewater. Sophomore Emily Fink started the day by competing in the 55-meter dash in a field of 107 runners. Fink’s preliminary time of 7.52 was good enough for 16th, earning a spot in the semifinals where she ran a nearly identical time of 7.53 to solidify a 17th-place finish. Junior Kortnie Volk followed Fink by competing in the 55-meter hurdles where a field of 71 girls battled for top honors. A new personal best time of 9.52 in the prelims earned Volk a spot in the semifinals where she was seeded 22nd of 24. She went on in her semifinal race to drop a quarter-second off her preliminary time to run 9.26, setting yet again a new personal best and solidifying a 21st-place finish. Fink added another strong outing in the shot put with a distance of 36-6 3/4 in the preliminary round to finish in 14th place out of 68 girls competing in the event. Volk continued her day with stellar performances in both the long and triple jumps, going 16-10 in the long jump prelims to earn a spot in the finals. There she set a new indoor personal best of 17-5 1/4 to lock down eighth place in the event. In the triple jump, Volk jumped well in preliminaries with an effort of 35-7 to earn a spot in the finals. In a field of nine finalists Volk used her final jump of the day to set a new school record of 36-2 1/4 to claim fourth place in the event. Senior Ayla Fairchild was the only other solo competitor for the Lady Bluejays, competing in the pole vault where she cleared the opening height of 8-feet, but struggled to move up in the competition. Fairchild joined forces with Fink, Volk and Kara Sowinski to round out the day in the 4x200-meter relay where their season-best time of 1:54.61 placed them 27th of 44 teams. In the afternoon the Walkowski brothers took part in the long jump with Brock pushing the tape to 18-1 1/2, good for 54th place overall, while Trevin jumped 17-6 3/4, good for 65th in a field of 98 competitors. Brock and Trevin teamed up with Parker Trollan and Jesse Dupuis to run the 4x200-meter relay and they ran a new all-time best of 1:36.93 to finish in 16th place out of the 52 teams. Their time also ranks as the fastest indoor relay time in Division 3, and is roughly only two seconds away from the Bluejays school record. Also taking part Saturday was senior runner Jared Zwettler. He competed in a field of 63 runners and posted a new indoor personal best with a mile time of 4:36.96. It cut a full five seconds off his previous indoor best and put him 17th overall. That indoor mile time ranked as the second fastest in the state for Division 3. The time was also a top-5 lifetime mile time for Zwettler. The Three Lakes-Phelps Bluejays will attempt to get their outdoor season underway this week with a relay meet at Wittenberg-Birnamwood set for Tuesday, April 9, followed by an invitational in Edgar, April 12. The Bluejays boys and girls took part in the Indianhead Indoor meet hosted by Ashland High School last week, competing against Drummond, Hurley, Mercer, Solon Springs, and South Shore-Washburn. The girls won the meet by more than 20 points over runner-up Hurley. The boys team finished runner-up behind South Shore-Washburn. Event champions on the girls side included Kortnie Volk in the 55-meter hurdles (9.50), Lily Campbell in the high jump (4-8), Emily Fink in the shot put (35-9 1/2), and the 4x200-meter relay team of Fink, Volk, Kara Sowinski and Sydney Lurvey (1:57.16). Kara Sowinski was a runner-up in the pole vault, as was Mollee Gruszynski in the high jump. The 4x400-meter relay team of Mollee and Sara Gruszynski, Ava Polcaster and Karmyn Meixner also took second place. Event champions on the boys side included Wangai Karianjahi in the 400-meter dash (58.88), Jared Zwettler in the 800-meter run (2:07.91), Hunter Meistad in the high jump (5-4), Trevin Walkowski in the pole vault (9-6), Jesse Dupuis in the long jump (19-3) and the 4x200-meter relay team of Brock and Trevin Walkowski, Parker Trollan and Jesse Dupuis (1:38.02).